Below is a list of confirmed public concert dates for 2013. See also private events. Info: (510) 644-2020, info@freightandsalvage.org. Facebook Event. Download Concert Poster. Press Release. Saturday, March 23, 8 pm, Ancient Future Duet with Matthew Montfort (scalloped fretboard guitar) and Mariah Parker (santur), Willits Community Theatre, 37 West Van Lane, Willits, CA 95490. Tix: $15. adv. in person at Good's Stamp Shoppe, 56 South Main St,Willits, by phone at WCT Box Office at 707-459-0895 with credit card, and at the door night of show. Download Concert Poster. Press Release. Saturday, March 30, 7 pm, East-West Guitar Summit with Matthew Montfort (scalloped fretboard guitar), Matthew Grasso (nylon 11 string guitar), and Parteek Bansal (tabla), TimnaTal Music Presents at Village Homes Community Center, 2661 Portage Bay East, Davis, CA 95616. Tix: $13 in advance, $15 at the door. Info: 530-867-1032 or email info@timnatalmusic.com. Saturday, May 11, 7 pm, Ancient Future Duet with Matthew Montfort (scalloped fretboard and fretless guitars) and Ferhan Qureshi (tabla), Halanda Studio for Dance and Fitness, 1062 Lincoln Avenue, San Jose, CA 95125. Registration: $20 in advance through Halanda Studio PayPal, $25 at the door. Info: 408-246-1129 or 408-369-1304. Email: info@halanda.com. Facebook Event. Press Release. Sunday, May 19, 2 pm, Ancient Future Duet with Matthew Montfort (scalloped fretboard and fretless guitars) and Ferhan Qureshi (tabla), Himalayan Fair, Live Oak Park, 1300 Shattuck Ave., North Berkeley, CA 94709. Friday, June 21, 8 pm, Ancient Future Duet with Matthew Montfort (scalloped fretboard and fretless guitars) and Vishal Nagar (tabla), Garden Gate Creativity Center, 2911 Claremont Ave. @ Ashby Ave., Berkeley, CA 94705. Tix: $25. Info: Call Rebecca Trujillo at 510-472-2834 or Diana Rowan at 510-717-7148. Email: gardengatecenter@gmail.com. Press Release. Saturday, July 13th, 2013, 3:30 PM to 6 PM, A Meeting of Acoustic Minds at The Old Princeton Landing with Matthew Montfort, Mark Kostrzewa and Steve Baughman, The Old Princeton Landing, 460 Capistrano Rd., El Granada, CA 94018. Tix: $10 advance/$12 door. 12 and under free. Info: 650-728-7096. 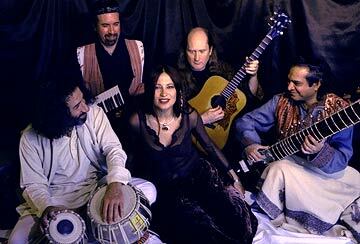 Saturday, September 14th, 2013, 7 PM, Musical Awakening of Indian Jazz Concert featuring Binay Pathak, George Brooks, Matthew Montfort, Abbos Kosimov, and Vishal Nagar, Harris Center, Stage 2: City Studio Theater, 10 College Parkway, Folsom, CA 95630. Tix: $25. Students with ID & seniors 65 and older, $20. Info: 916-608-6888. Facebook Event. 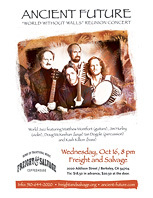 Wednesday, October 16, 8 pm, Ancient Future Reunion (lineup that recorded World Without Walls and Asian Fusion), Freight and Salvage, 2020 Addison Street, Berkeley, CA 94704. Tix: $18.50 in advance, $20.50 at the door. Info: Call 510-644-2020 or email info@freightandsalvage.org. Press Release. Poster (703 k pdf). Facebook Event. Wednesday, November 13, 9:00 pm, Acoustic Guitar Showcase featuring Matthew Montfort, Jeff Titus, and Teja Gerken, The Sleeping Lady, 23 Broadway, Fairfax, CA 94930. No cover. Info: 415-485-1182. Facebook Event. Sunday, November 24, 10 am, Ancient Future Guitar and Tabla Duet with Matthew Montfort (scalloped fretboard guitar) and Vishal Nagar (tabla), Please Stand By on KPIG 107.5 (Freedom,	CA) and KPYG FM 94.9 (Cayucos/San Luis Obispo, CA)streaming live online at www.kpig.com, Watsonville, CA 95076. Thursday, January 14, 2010, Matthew Montfort performed a live studio performance and interview on Bryan Chandler's show on KUSF, 90.3 FM, San Francisco, CA 94117. Listen to the archived show at kusf-archives.com. Thursday, October 21, 2010, Matthew Montfort and Mariah Parker performed a live studio performance and interview on Bryan Chandler's show on KUSF, 90.3 FM, San Francisco, CA 94117. Listen to the archived show at kusf-archives.com. Due to decades of arts cutbacks, many of the presenters most supportive of world fusion music have suspended operations or are cutting their seasons. For our 34th season, we need your help to replace lost operating income caused by diminished arts support. More info.